Maison Martin Margiela wows us again with their new sneaker offering—this time with a no frills profile to give minimalist sneaker lovers another item to add to their collection. 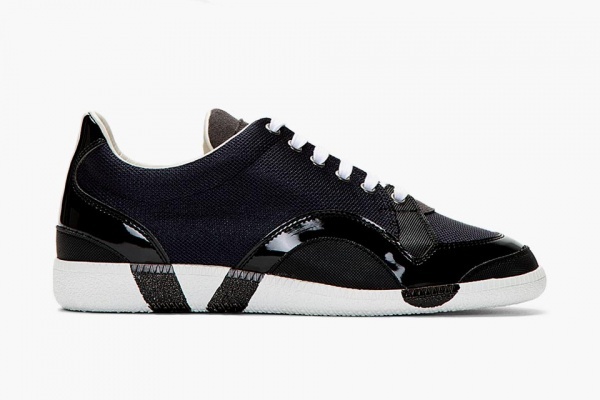 The Maison Martin Margiela Navy Mesh Panelled Sneakers is a low-top rendition of their recently launched Mesh Panelled sneakers. This time though, the navy mesh panels are contrasted beautifully by black patent leather accents snaking from the heel panel to the front of the shoe. The Italian-made sneaker is another gorgeous footwear from the French fashion house that never fails to impress us with their sneaker designs.